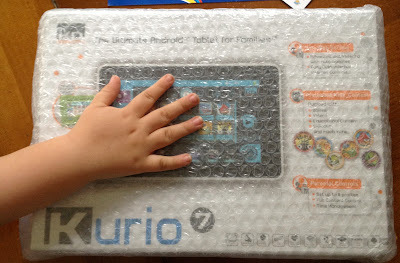 Ever since I had a play with the Kurio from InspirationWorks at the mi-comms PR Christmas Open House I have been dying to get my hands on one so I can put it to the test and explore it fully. Today I am happy to say the wait is over - our Kurio has arrived! 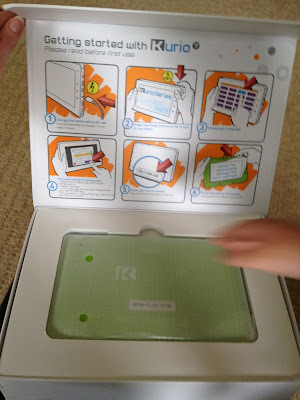 As it is such an exciting new product I have decided to share my experience of using it in a series of posts throughout the week which will cover a range of topics starting with the fun process of unboxing it. 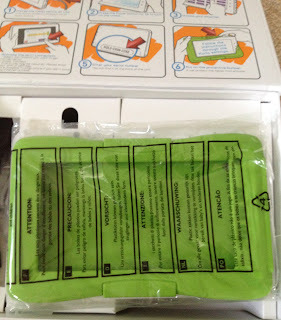 I love when a tech product comes packaged in a way that makes the whole process of opening and unwrapping the goods inside a special and exciting experience. 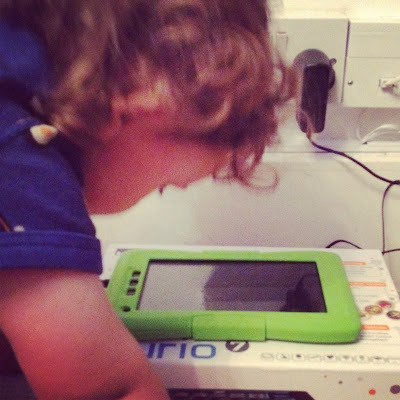 This was definitely the case with the Kurio which comes beautifully packaged in it's box which flips open at the front and lifts up to reveal the fantastic new tablet inside, it's funky green bumper, the charger, USB adapter, USB lead and documents. Inside the lid is a quick and easy to follow Getting started with Kurio guide which covers the things you need to do to get it up and running in six steps. 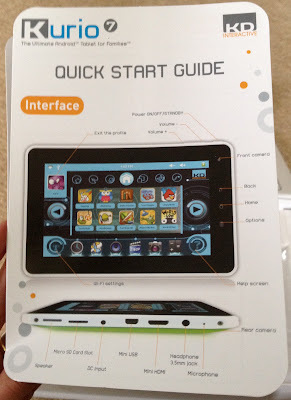 The first step is to charge the tablet before first use with a recommended charge time of at least three hours. The fact that you need to charge the Kurio before use is an important point to note if you are getting one as a Christmas present for your child. 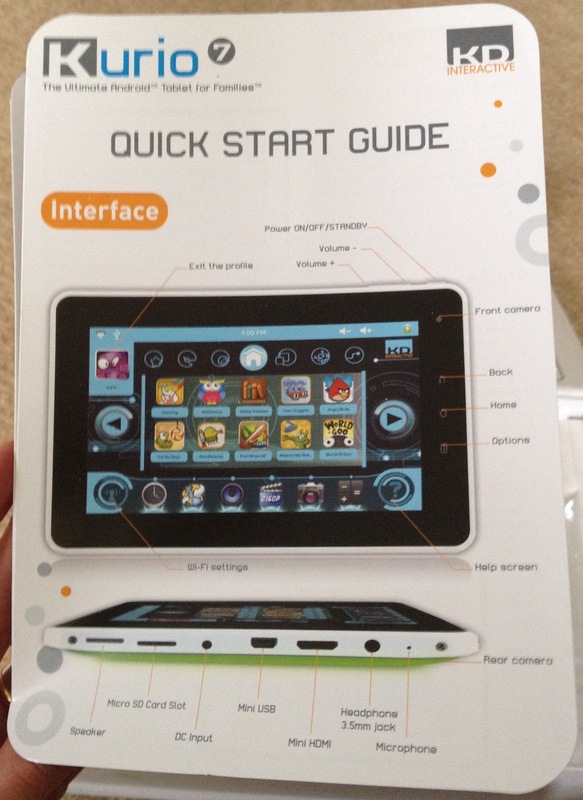 Inside the box you will also find a Quick Start Guide which details everything you need to know about the Kurio including the interface features, setting up accounts, parental controls and much more. The guide is well written with clear and comprehensive instructions which should make setting up the Kurio easy and straightforward. I shall be following it closely this week so we will be able to confirm just how good it is. Right now our new Kurio is currently on charge, I look forward to setting up our user accounts tomorrow and having a play. *Disclaimer: I received a Kurio free of charge but this has in no way biased my opinion. It is certainly living up to my expectations so far. Very impressed by it. glad the reality is as good as the promise - thought it woud be! Bought 2 10 inch ones for xmas for granddaughters. Already chargers not working. So far taking 2 hrs to charge via laptop only 5% charged! !